I love variety and S/S 17 offered me just that. From high end gowns to casual wear, from deconstructed to conceptual - there was a bit of everything. High on my list were the number of young designers. Some were showing their very first collections. Others have a few years of industry experience, but are still fairly new to the industry. They all bring fresh ideas to the table that I don't always understand, but love to be challenged by. It was also great to see so many local designers on the runway. Our city is filled with strong talent and I am the proud owner of many Vancouver designed garments. Lastly, there is the wonderful international element, giving us all a glimpse of what the world has to offer. Some like Iarocheski and Gatsbylady London have showcased here before and developed a local fan base. Others were brand new to the event. images on my little point and shoot. My outfit today was a nod to the more casual side of things. 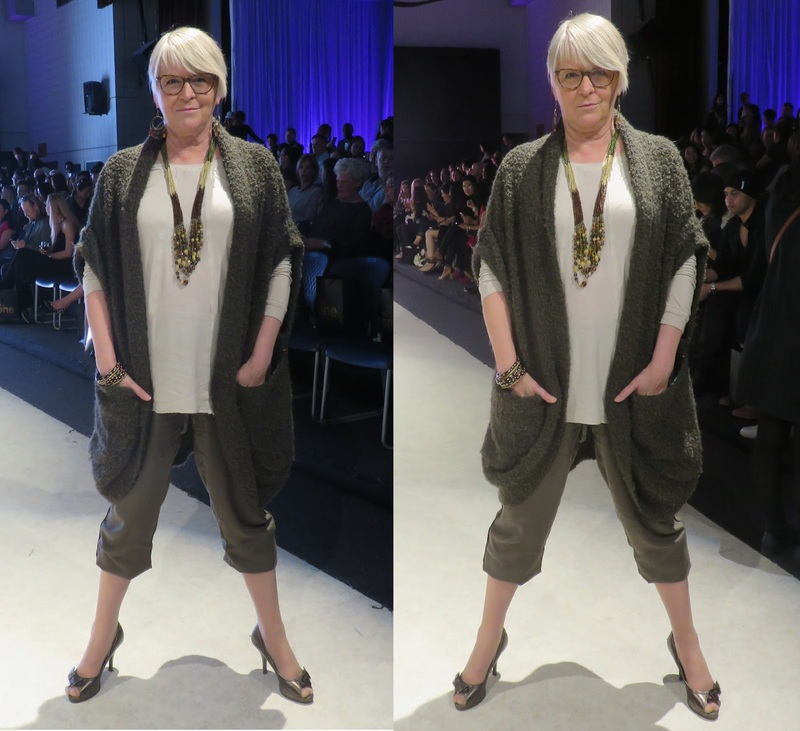 The great knit vest is from Kersh, the taupe knit & woven top is by JAC and the capris were purchased at Aritizia. The wonderful eye wear I've been sporting all week is from The Optical Boutique. I am so grateful to owner Sue Randhawa for her guidance in selecting just the right frames. My great hair cut is by my wonderful stylist Myles Laphen. The first time I sat down in his chair, he challenged me to try something new. Fortunately, after a deep breath to release the fear, I said I would give it a try and left it in his capable hands. I always receive compliments. Now for a story. Myles often checks my event images and noticed I always pose the same way. What can I say - I pretty much have one angle. At a recent appointment, he suggested a different pose I might try. So on Sunday, in honour of all his hard work, I gave it my best effort - once smiling and once trying to have a fierce look. The fierce look was the biggest challenge. The camera would come up and I would start to smile and crack up. I never managed to pull it off, but who knows - maybe next time. But there you go Myles - a new pose just for you. On to today's coverage. There were a large number of local designers today - Je Vis Bridal, Sally Omeme, Sam Stringer, Atelier Grandi and Invido Jeans - so be sure to check out my BUY LOCAL column where they will all be featured. If you saw this show, you'll understand how surprised I was to know this was designer Johanna DiNardo's grad collection - expanded by several looks to create a full show. To say she is talented is in understatement. The show offered drama. From the first model coming out with just her eyes and hair peeking above the collar of her all black ensemble to the final show-stopping gown, the audience was entranced. Her love of couture construction, flattering silhouettes, strong fabric choices and obvious eye for luxury were evident throughout. DiNardo earned her BA in Fashion Design at Drexel University as well as studied at the London College of Fashion under Marios Schwab. This collection received the highly coveted Nicole Miller Award for Best Dresses. From her bio, "Johanna’s design strengths stem from being a visual, hands-on designer. Her insatiable affinity toward luxury, and unique approach to design, integrating rich texture whilst creating shapes of a draped yet tailored quality, define her aesthetic. Exuding a powerful femininity and timeless modernity, Johanna specializes in luxury womenswear, eveningwear, and embellishment design." Born in Calgary, New York based designer Jacqueline Zeyi Chen is a graduate of the prestigious Parsons Fashion Design program. This wonderful collection was a great counterpoint to all the luxury gowns seen before. Flowing silhouettes, a soft palette of white, light grey and soft pink and a mix of textures created a beautiful ambiance. The shapes were unexpected, each offering a different way of looking at classic shapes. I would sit back for a moment to take each garment in and then lean forward to search out the small details. From her bio, "Jacqueline gets inspiration from issues in the society or within herself. She uses fashion as a medium to express her point of view, bring awareness, and explore problems in life. For this past year, her focus has been on ‘body violence’ where she explored the physical violence and mental violence associated with cosmetic surgery, over-prescription, and rare allergy she herself experienced in her capsule collection." I found this inspiration interesting because her collection did not disturb me, it put a smile on my face. Designer Song Ryoo was raised in Scandinavia in a small geometric, minimal living space filled with the minimal decor typical here. Her mother was an interior decorator and introduced her daughter to the elements of shape, line and form. After high school, Ryoo chose to study Fashion Design at highly regarded Parsons. Both of these elements - the artist and the designer - were showcased in her collection this evening. I was drawn to the way she played with structure and line in each beautifully tailored garment. Watching I was reminded of the words of Tim Gunn who is always reminding young designers that less is more. That was certainly true here. Clean lines and geometric shapes paired with an uncluttered palette created a stunning, strong design statement. From her bio, "Song Ryoo views herself as an artist first and foremost, who demonstrates a cutting edge talent of generating a new life-style concept for her clients. Drawing inspirations from everyday elements surrounding the designer...Ryoo was selected as Designer of the year Womenswear Finalist and Kering X Parsons + Vogue.com 2016_ Empowering Imagination Finalist this year. Also, Ryoo was selected from among her peers to receive sponsorship by Luxottica, Lineapelle, and Cobbler Concierge."